Preparing the next generation to inherit the family enterprise is the single most important determinant of a successful generational handoff. It depends significantly on both the senior generation and next generation taking active roles in the preparation process. Specifically, what can each generation do to help develop the next generation? What does each generation want from the other throughout this journey? These and related questions have been discussed by families from around the world every year since 1997 at the Families in Business program at Harvard Business School—a six-day program that examines pivotal issues facing family businesses. 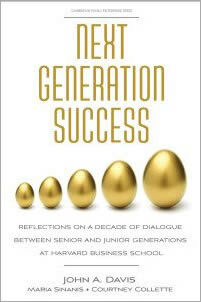 Next Generation Success offers a convenient summary of these rich conversations between senior and next generation members regarding what each generation can do to help the next generation develop as effective managers, owners and family members. The perspectives of both generations are distilled and compared over a 10-year period. Next Generation Success offers readers the sense that they have sat down and talked with their parent or child to understand what the other generation wants from them. Included are John Davis’ candid letters to both generations offering wisdom and compassionate advice on managing the challenges—and enjoying the rewards—of successful generational transitions. The authors have deep insights into the intergenerational conversations due to their involvement in the Families in Business program for several years: John Davis as chair and co-founder since 1997; Maria Sinanis as a guest lecturer and facilitator of family meetings since 2010; and Courtney Collette as facilitator of family meetings and co-designer of the curriculum with John Davis since 2003.